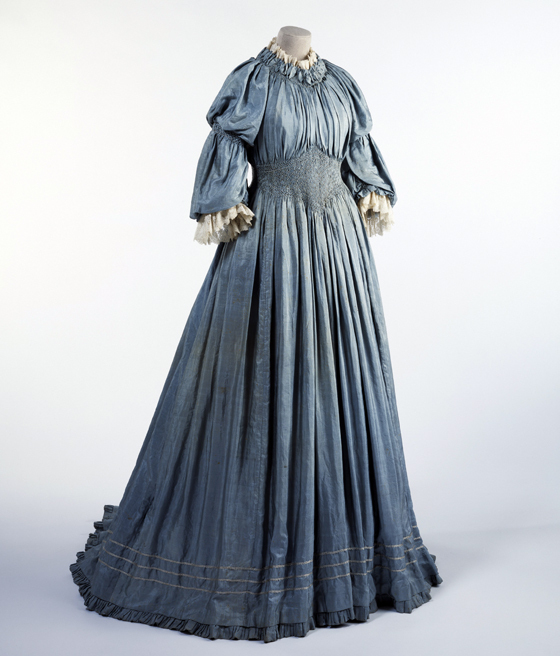 The V&A's Victorian dress collection represents the fashions worn by the wealthy in the 19th century, and reflects their lives and aspirations. 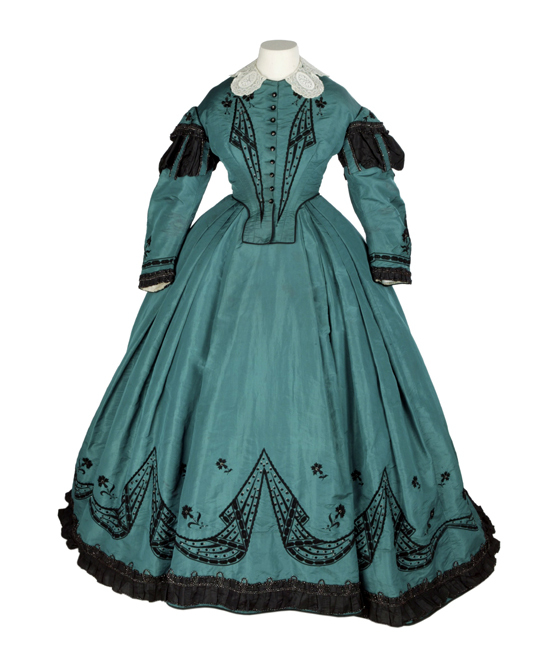 The clothing featured here also showcases the high level of skill in dressmaking and design carried out by dressmakers and tailors in Victorian times. The degree of workmanship involved in making these clothes meant that they were expensive to make -they were high fashion comparable to today's haute couture. Very few examples of men's clothing have survived from this period - generally men's fashions changed slowly and darker colours were often worn for business and on formal occasions. This meant that even expensive garments could be worn longer and were worn out with day-to-day wear. The poor would rely on the huge second-hand clothes trade prevalent during the period, spending hours altering old clothes for themselves and their families to make them fit or to make them more fashionable. Clothes could be dyed and the good parts of a garment made into children's clothes or accessories, and areas of wear could be patched. There was even a market for ragged clothes that had been through several owners - these were still worn by the destitute. 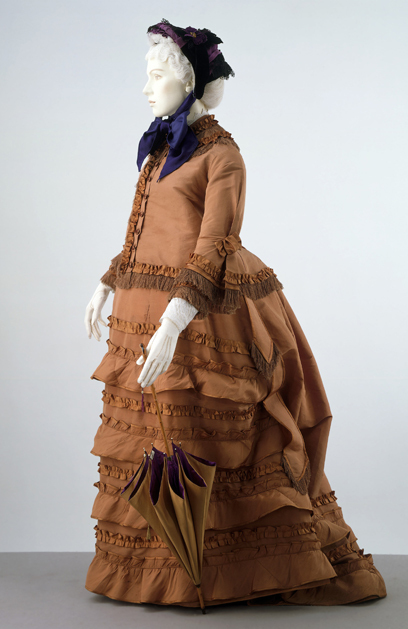 Women's skirts swelled between 1840 and 1860. 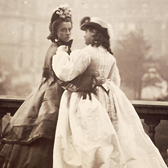 At first the skirts were supported by several petticoats, one of which was of a stiffened silk or of a silk and horsehair fabric, known as crinoline. When the frame of pliable steel hoops was invented in 1856, it was known as the cage crinoline. 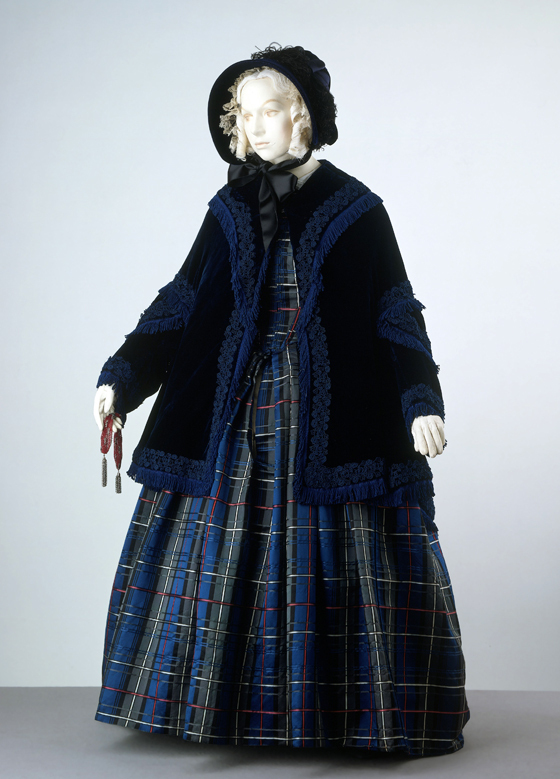 It would have been very heavy and cumbersome to wear a full-length coat over a crinoline skirt, so mantles, shawls or short jackets were more convenient for outdoor wear. Fibres used were all natural ones such as cotton, wool and silk. Making the very tight bodices and sleeves of women's dresses required far more skill than the straight-seamed skirt. The fitted bodice has a low, round neck and a slightly high waistline. The skirt is box-pleated more tightly at the centre back. The sleeves are set low, tightly pleated below the shoulder. They have been altered by having the fullness reduced and a frill attached at the elbow. The sleeve puffs are stiffened with calico and supported with tapes. The main seams are faced, the bodice is lined with cotton and the skirt faced with glazed cotton. Bonnets were fashionable at the beginning of Queen Victoria's reign when indoor caps were still worn by most married women. 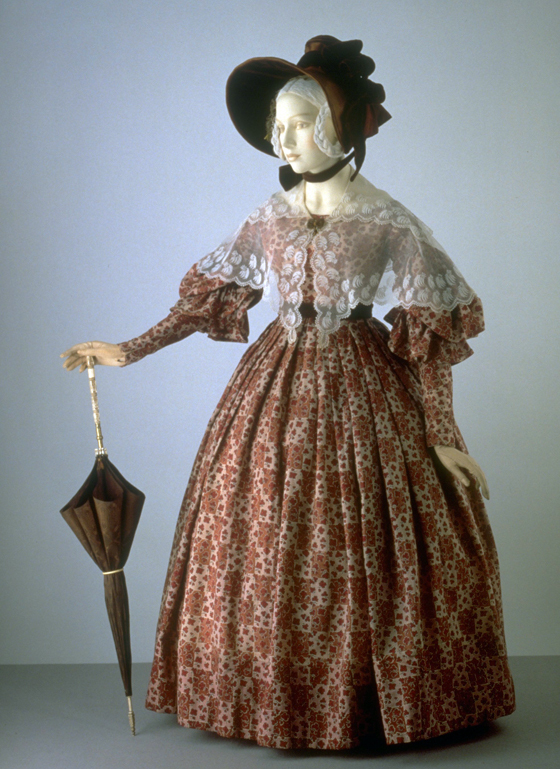 Both started to go out of fashion in the 1860s when hats gradually replaced bonnets and indoor caps were worn only by widows. 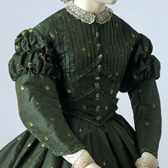 Green silk bodice and matching skirt. The silk material is hand-embroidered in silk and cut-steel beads, trimmed with taffeta and with a lace collar. The long skirt is fuller at the back and flatter at the front in keeping with the fashion of this period and would be worn over a steel hooped crinoline petticoat to give this distinctive shape. The celebrated dancer Mlle. Fleury stands with her body turned half to her left, her arms curving to her left, her head turned to look across her right shoulder. Her hair is severely dressed, with a flower decoration to the back. 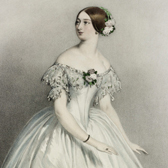 She wears a white off-the-shoulder crinoline ball dress, with a pointed bodice trimmed over the neck and upper arms with lace and with a posy of flowers centre front; the bell-shaped skirt has a shorter overskirt of a diaphanous fabric, slit over the legs, and decorated at the top of the slit with posies of flowers. Crinoline frame made from hoops of spring steel covered in braid. The hoops are fixed to black edged tapes wth stamped metal eyelets. There is a red woollen waistband with a frill made from horsehair, and an elastic stay holds the hoops in place. Print: The English Woman's Domestic Magazine: an illustrated journal combining practical information, instruction and amusement. 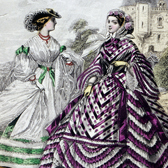 Fashion plate showing two fashionably dressed women in brightly striped crinoline dresses. In 1852, publishing entrepreneur Samuel Beeton launched 'The English Woman's Domestic Magazine' at the startlingly low price of 2d a copy. An instant success, it had achieved a circulation of 50,000 by 1860 and became the `blueprint for the modern magazine industry'. It appealed to the rapidly- expanding middle-class sector who relished the mix of fiction, fashion and food, the latter provided by Beeton's wife, the soon-to-be lionised Isabella. 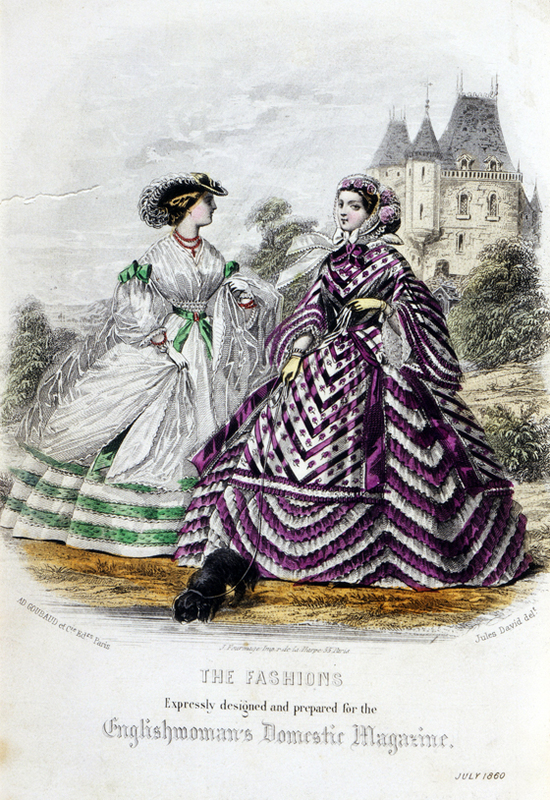 Isabella visited Paris regularly and acquired fashion plates from Adolphe Goubaud's Moniteur de la Mode. A feature of Beeton's magazine was the "Practical Dress Instructor," a forerunner of the paper dressmaking pattern. In 1861, Beeton followed up his success with 'The Queen', a weekly newspaper of more topical character. Dress and mantle England Mid-1840s Satin dress and velvet mantle Museum nos. T.169-1959, T.170-1959 © Victoria & Albert Museum, London The dress has a high, round neck, fitted bodice and a waistline with a rounded point to which the skirt is flat- pleated except for a panel of tight gathering at the back. There is a front lace fastening. The sleeves are long with an open epaulette. The only trimmings are the agate stud buttons mounted on black velvet bows above the wrists. The bodice is piped on all the main seams, lined with cotton and boned. The skirt is lined with yellow and white washed and re-used figured silk. The back is softly interlined. There are yellow chamois dress preservers. The mantle is lined with black quilted silk and fastened with concealed hooks and eyes. It reaches to the knees and has openings for the arms. It has a rounded collar and is flounced from the waist to the hips. The edges are trimmed with matching looped braid and fringe. 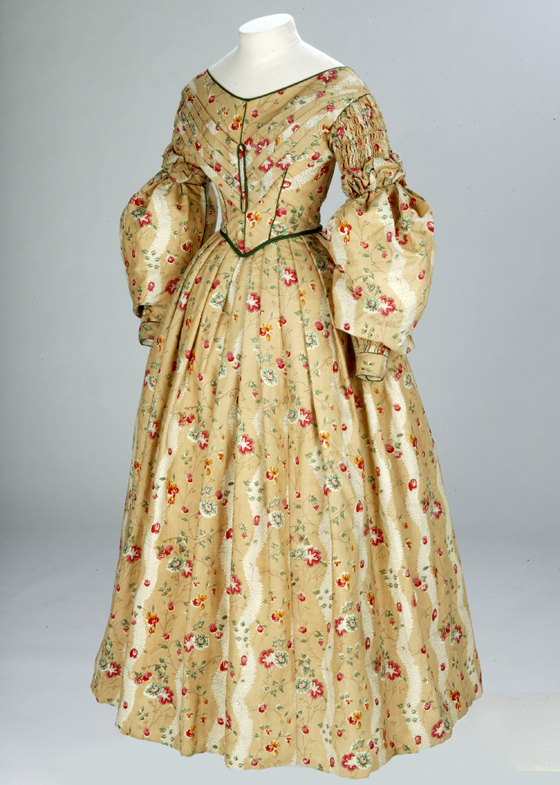 This 1830's English day dress is cotton printed in a soft pink, red, white and green floral motif against a soft light brown ground. It is edged with green silk satin piping and lined with linen and cotton. The sleeves are tightly gathered around the top and loose at the elbow. 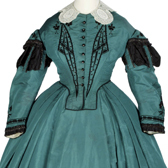 The long skirt is gathered in at the waist of the tight fitting bodice which is edged with green satin piping. 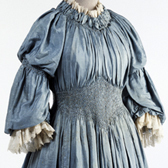 Dress with long puffed sleeves comprising a bodice, skirt and belt. In woven green silk with a white floral design and trimmed with silk braid and beads, lined with glazed cotton, and edged with brushed braid. 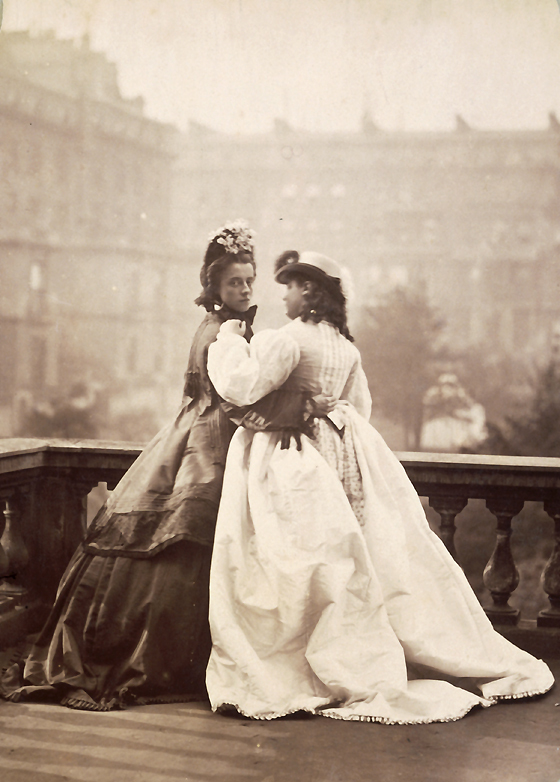 In the last decade of Queen Victoria's reign, women's clothes were plainer, and the bustle smaller. 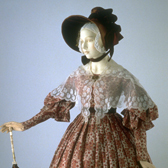 Day dresses show that women were leading rather more active lives. 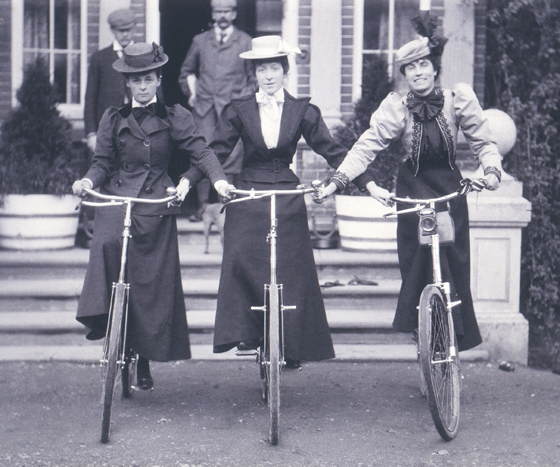 However the dresses of the 1890s, with their very small waists and need for tight stays, still restricted movement. 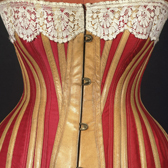 Many of the bodices and blouses had high necks stiffened with bones or wire. The chin had to he held up and the hair was puffed out and topped with a large hat, secured with a hat pin. 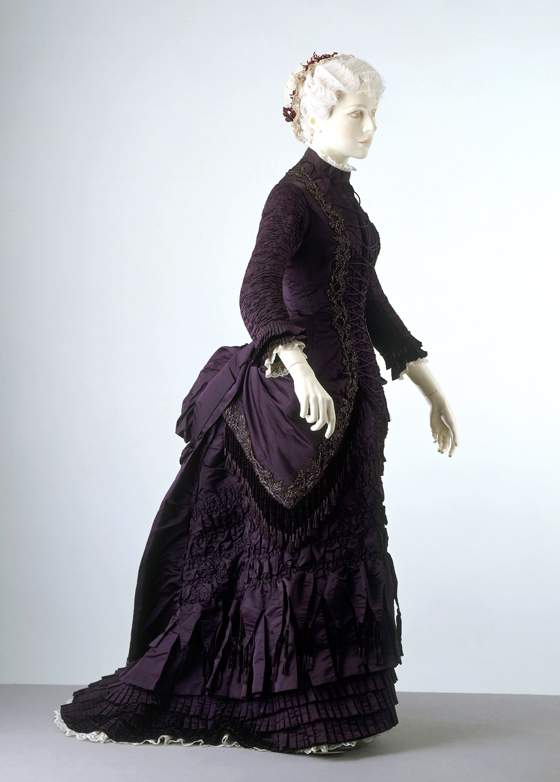 Evening dresses were made from luxurious, heavy silks and had boned bodices and trains. The dress fastens at the back from the narrow band collar to the hips with silver-plated buttons in a Florentine design. The tight, three-quarter sleeves are entirely gauged and trimmed at the cuffs with two rows of pleated bands. The front is fitted to the figure as far as the hips, and is designed to suggest a jacket. It is trimmed round the edges with motifs in iridescent beads and worn over a pleated and ruched stomacher front with a mock lacing. At the hips it is draped back into paniers which knot over the train. 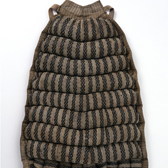 The skirt is ruched as far as the knees, where it is arranged in pleated tabs with pendant chenille tassels mounted over crenelated tabs and bands of pleats. 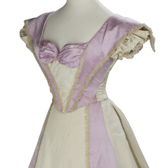 The sleeves and the bodice (which is boned) are lined with white glazed cotton, the skirt with mauve polished cotton. The back breadth is lined with stiffened cotton and held in place with tapes. Woman's underwear in the 1800s. V&A collections. Combinations: white cotton with Bedfordshire Maltese lace trimming around the neck, sleeve and leg. The front is trimmed with hand-made insertion and white work embroidery, seamed to fit the body and fastened down the front with cotton washing buttons used to fasten the rear flap. 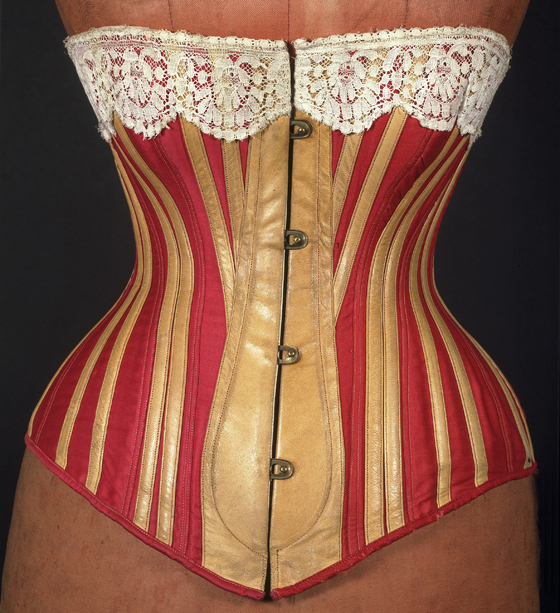 Corset: red sateen with bones covered in yellow leather, fastened with a spoon busk. 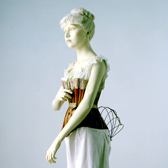 Steel wire bustle: the bustle was constructed to compress when the wearer was sitting down. The dress consists of a loose, waist-length bodice which fastens in the front and is worn inside the waistband of the matching skirt. It is lined with glazed linen and held in position with tapes at the waist. The sleeves are a short wrist-length with a trimming of ruching and fringe for the cuffs. 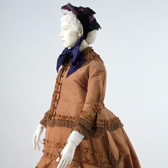 The skirt is gored, fitted to the hips with darts and tightly gathered at the back. Inside are tapes and loops to adjust the length and drape. The jacket is a short hip-length and loose in front. It is longer at the back and is semi- fitted with a central vent. It has a round neck trimmed with ribbons and fringe and fastens with covered, embroidered buttons. 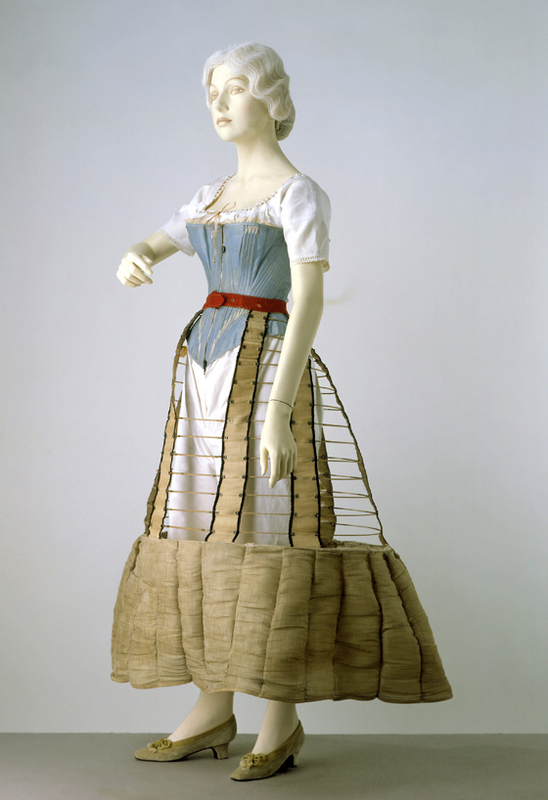 The loops and tapes within the skirt are a simple but effective way of adapting a skirt to a bustle. 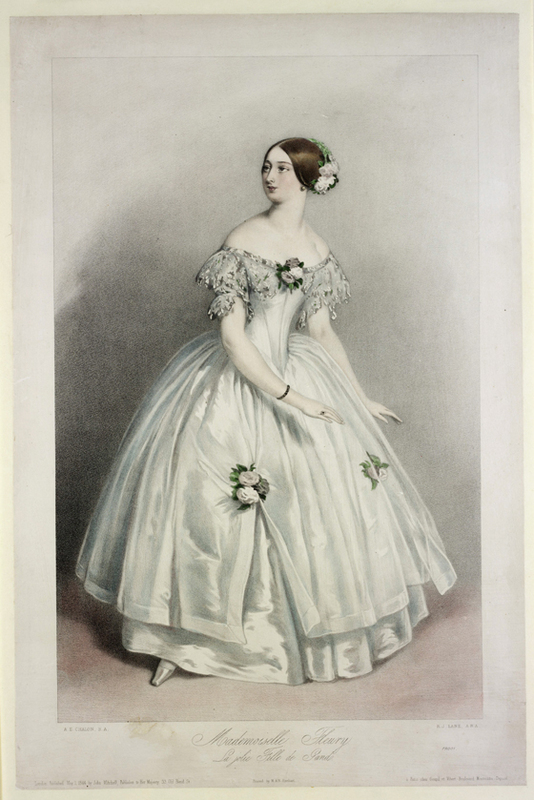 Fashion plate: A Bridal Costume France 1872 Print Museum no. 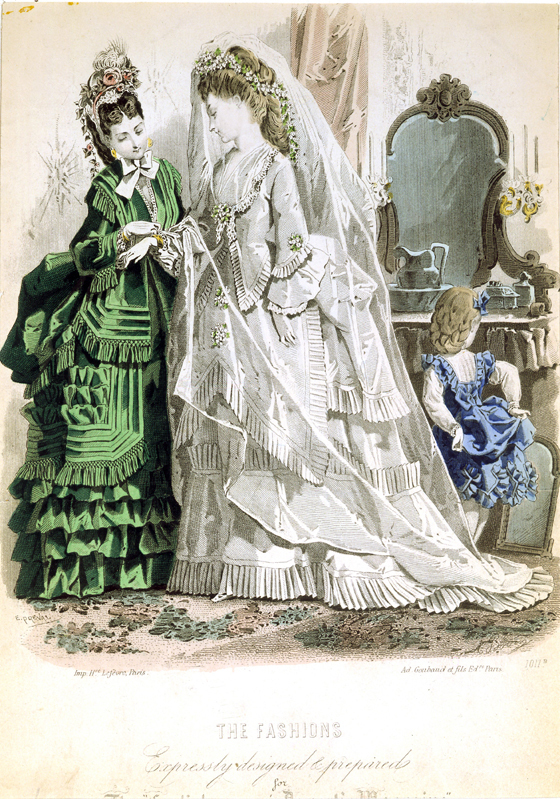 E.2221-1888 © Victoria & Albert Museum, London Fashion plate: A Bridal Costume, showing two women, one in her wedding dress complete with floral garland in her hair and a long veil, with pleated edging to the many layers of her dress, and large bustle. 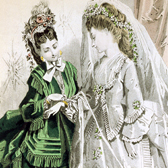 The other lady is dressed in a dark green dress, also with layered skirt with pleating, tassles and large bustle and a floral bonnet. She is adjusting the cuffs of the bride to be. Behind the bride is a little girl mimicking the bustles of the older women by pushing up the back of her pale blue dress, and looking into the small mirror on the floor. The designers now dictated what was to be worn and the very wealthy would go to them for custom-designed clothes. As more and more fashion magazines were published, the new fashions were seen sooner and by more people who then copied the designs. The advances in textile machinery and, above all, the sewing machine, meant that many more people could have new clothes. Early machining, however, was in chain stitch and unreliable, and fashionable ladies still preferred to have their clothes made by hand. 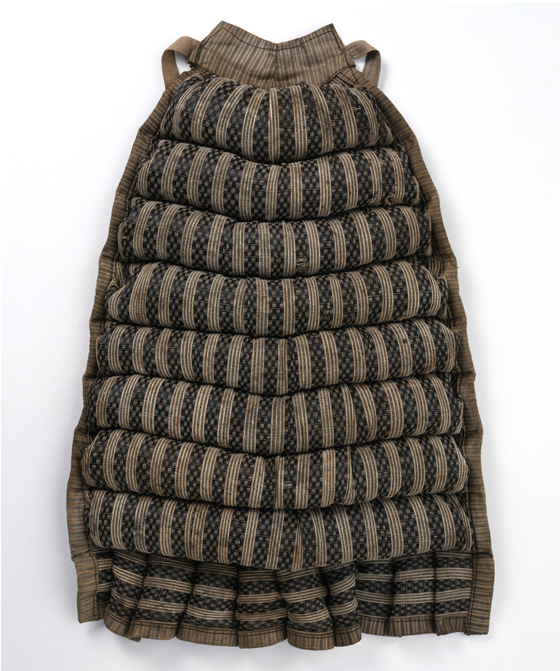 Bustle pad, woven and padded with horsehair with eight separate padded bands, all in striped and black checkerboard pattern going vertically, the band at the bottom striped horizontally. The bodice is made in the Princess line, and is seamed and gored for a moulded fit. It fastens with laces at the front and has a deep, square neckline trimmed with pearl-embroidered machine- made lace. The sleeves are elbow-length and narrow but slashed, with the openings filled with lace. The bodice extends into drapes at the hips, merging with the train which falls in inverted pleats from the seams of the bodice. The border of the train is scalloped, trimmed with machine- made lace and mounted over a pleated band. The skirt has a front panel of cream satin with a formal floral pattern machine-embroidered in silk and chenille in shades of pink, bronze and green, the centre trimmed with bead tassels. 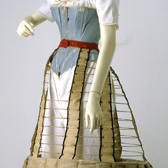 The dress is lined with white silk, the bodice is boned and the skirt is hooped at the back with tapes for adjustment. Label: Worth, Paris is machine-woven on the waist-tape. Marketing and manufacturing were changing rapidly. The first haute couture dressmaker, the Englishman Charles Frederick Worth, had opened a house in Paris in 1856 and others quickly followed suit. 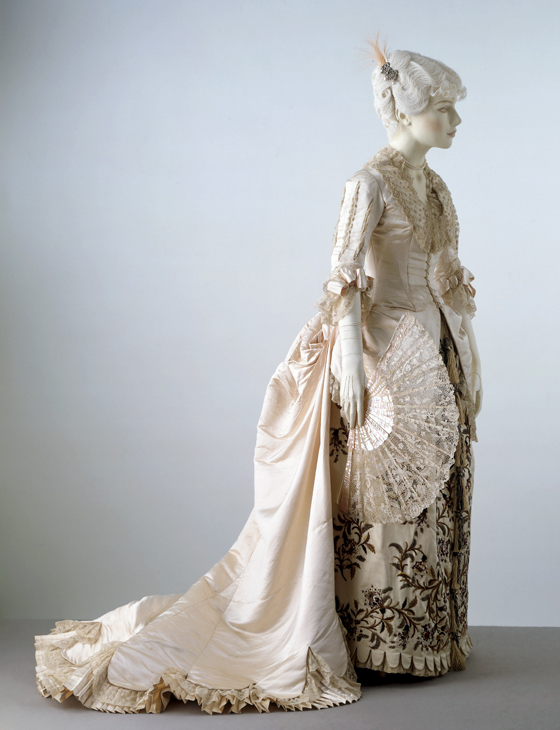 The earliest dress known to be by Worth is an ivory silk evening dress of 1881. 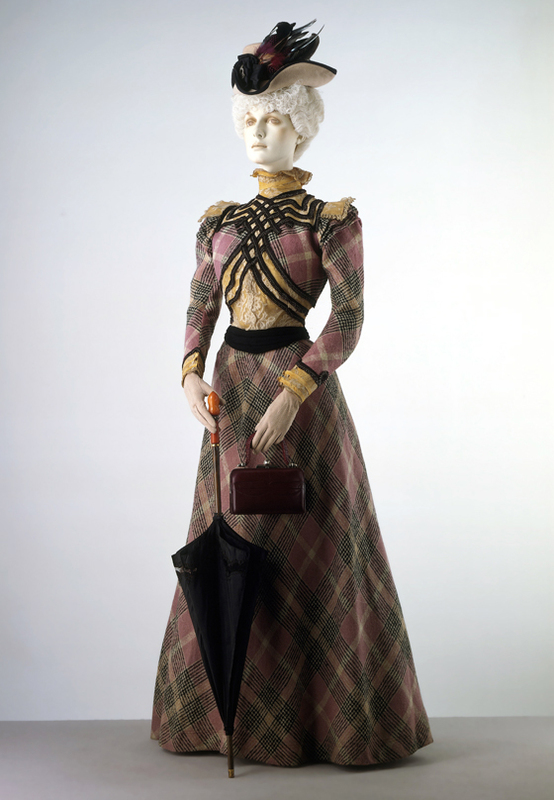 This evening dress ensemble is from the late 1890's and is made of silk satin and gross grain trimmed with tulle. Lined with cotton, whale bone and starched gauze. 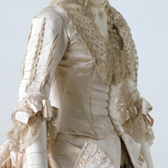 The front is cream with pink trimming around the bust and panels on each side of the skirt and bodice. Bodice and skirt in wool check. The waist-length bodice is designed to suggest a bolero jacket, to which is applied bands of black silk braid edged with a black and white fringe. The sleeves are long and tight with a slightly puffed and tucked sleeve-head. The bodice is mounted on and fastens over a front-fastening cotton lining, boned at the main seams. The skirt fits closely and is made from two cross-cut main panels, with a double box pleat at the centre back hem and faced round the bottom with lilac silk. 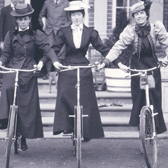 Photograph showing three smartly dressed young women sitting upright on bicycles, supporting one another by holding on to the handlebars. It seems a perfect metaphor for sisterhood and the emancipation of women. The names of the women have been inscribed beneath the photograph - Mabel Asser, Lily Carver and Laura. In the mid nineteenth century, the group of artists known as the Pre-Raphaelite Brotherhood used medieval and Renaissance-style dress in their paintings. 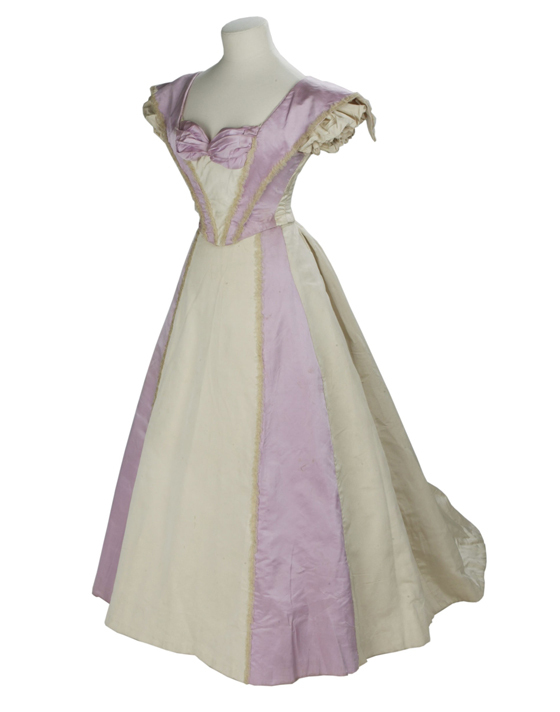 They designed theatrical costumes which were intended to be both historically accurate and graceful. Several of them, actresses and others with artistic leanings, took to wearing such clothes all the time. Gradually the style took a definite form of its own which marked the wearer as being 'artistic'. This style was also known as 'aesthetic' dress. Red satin corset, bound with yellow leather in stripes with a lace trim at the top and a leather panel down the centre with metal loop and stud buttons on the front. This was the kind of restrictive garment that dress reformers rejected. 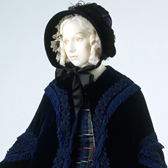 The dress is made of blue pongee silk trimmed with smocking and machine-made lace, full length with a train. It has double puff elbow-length sleeves, trimmed with smocking and frilled edge. It fastens at the back with brass hooks and silk eyes. The bodice is lined with silk twill and well boned. The waist-band fastening is of corded silk with a double-pronged buckle. The skirt is lined with cotton. Artistic dress was quite distinctive. 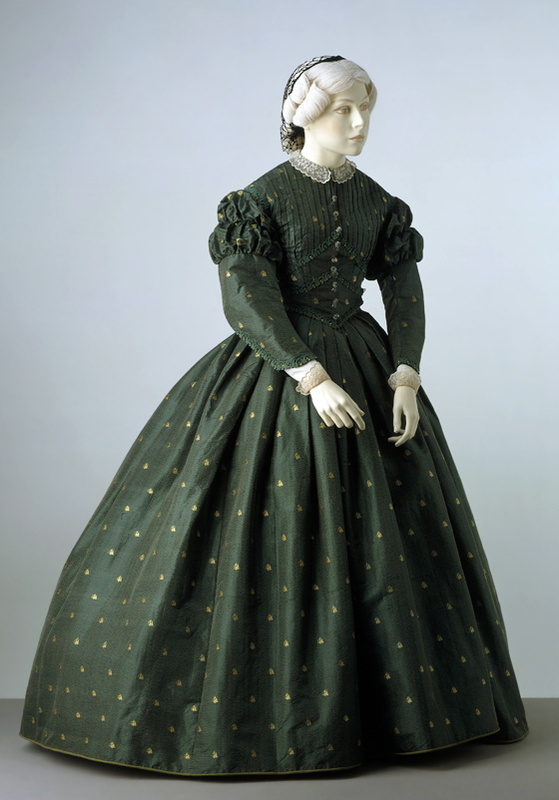 In the late nineteenth century women wore soft dresses with long sleeves, sometimes drawn in at the waist. 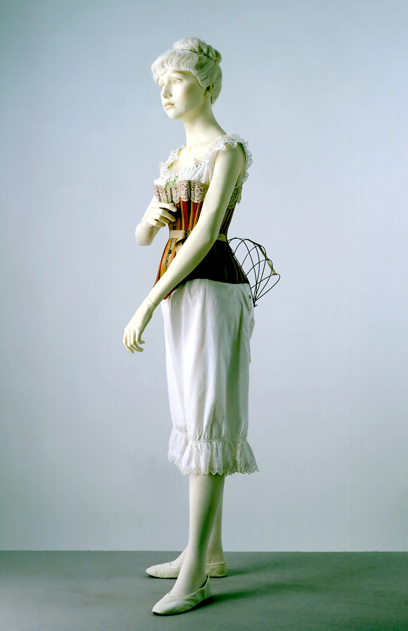 Tight corsets were not essential but a lightweight corset with minimal boning was worn to support the bust. The skirt could be slightly trained and it hung in folds. There were no hoops or frames to extend it in any way. 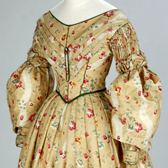 The waist was often raised and the upper sleeves were puffed. The decoration might be inspired by ancient Greek or Italian Renaissance dress. Lightweight, washable fabrics as well as winter velvets and wools in colours considered to be artistic were popular. 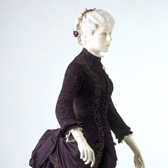 In the 1870s lemon, mint green, cream, fawn and salmon pink were favoured, and later in the century soft deep purple and greens were worn. 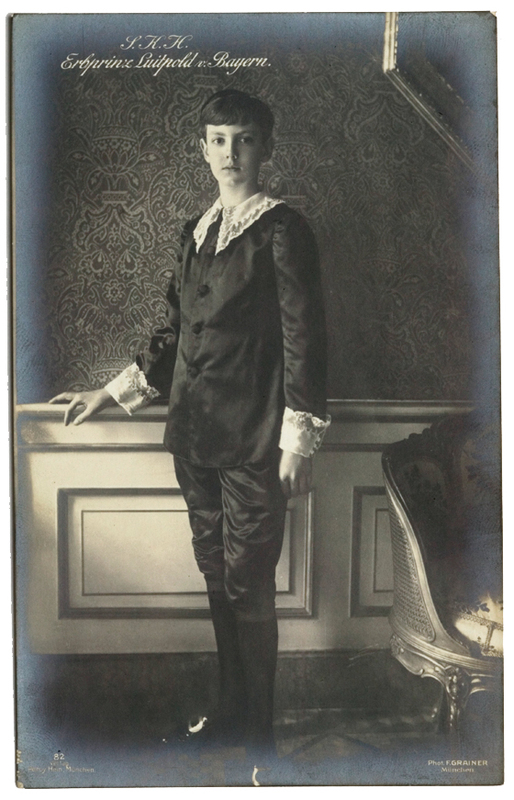 Photographic sepia postcard of portrait proportions, showing Prince Luitpold of Bayern in aesthetic dress of the type made popular by Oscar Wilde. He wears a loose-fitting single-breasted jacket of dark satin with lace-trimmed collar and cuffs, matching satin knee- breeches, dark stockings, and black patent pumps with large buckles. He is standing by a Louis Quinze sofa in a half-panelled room with an arabesque patterned wallpaper. Artistic men often wore a wide-brimmed soft hat, long hair and sometimes adopted knee breeches. 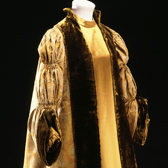 Artistic dress continued to be worn throughout the twentieth century. However, after the First World War, mainstream fashionable dress became less cumbersome and restrictive. 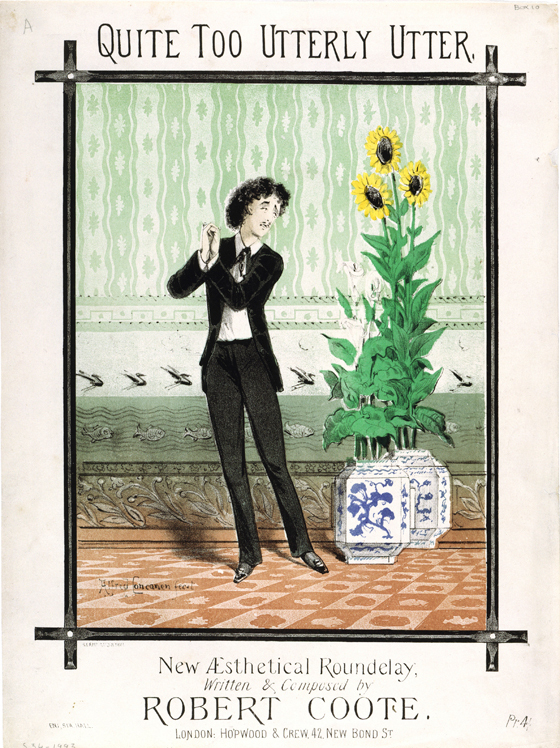 Songsheet 'Quite Too Utterly Utter; A New Aesthetic Roundelay' showing an image of a long-haired artistic man in a velvet jacket, a soft-collared shirt with a necktie, his hands clasped, singing the praises of two large octagonal vases with large plants one of which is a sunflower. 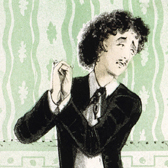 The song satirises the Aesthetic Movement of the 1880`s. 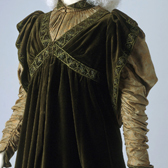 Artistic men also wore velvet, which was only worn in fashionable circles for informal garments such as smoking jackets and caps. 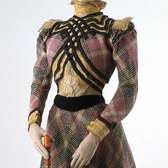 This style of dress was satirized in Gilbert and Sullivan's opera 'Patience', first produced in 1881. It poked fun at the attitudes of the aesthetes whilst at the same time showing the public the beauty of their art and dress, and promoting the store Liberty in the printed programme. The costumes were all made from Liberty fabric. Made in Liberty's Artistic and Historic Costume Studio for a member of the Liberty family. 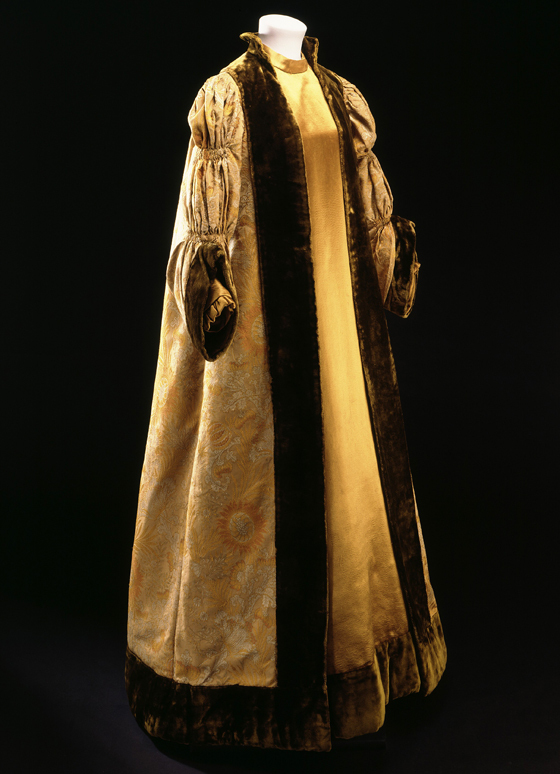 Robe of silk and cotton brocade with a silk-satin front panel, silk-plush edgings and a taffeta lining. 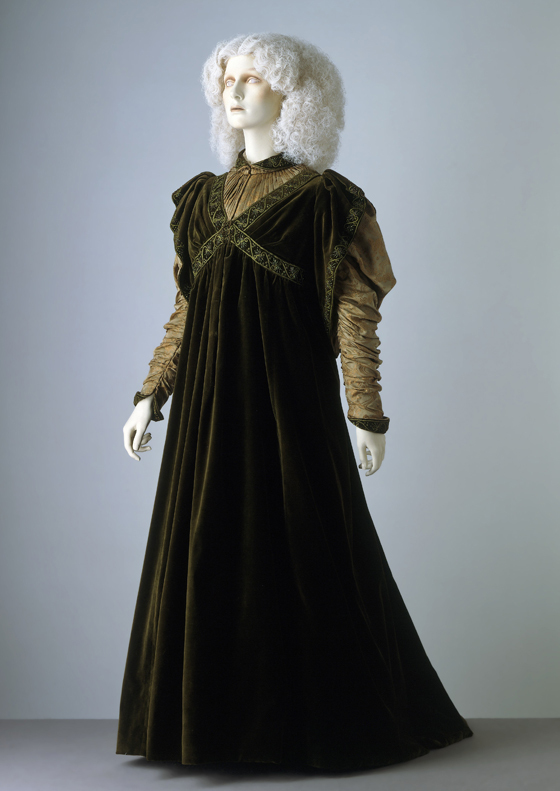 The puffed sleeves, wide cuffs and velvet edgings is inspired by plain, loose 16th century gowns. The woven sunflower and pomegranate motif was a recurring design on objects associated with the Aesthetic Movement and the subtle tones were popular 'artistic' colours used in both dress and furnishing in the 1890s. In 1875 Arthur Lazenby Liberty opened the store in Regent Street, London, which is still there today. As well as specialising in importing Far Eastern and Indian goods, the firm commissioned designs from both new and well-established designers and craftspeople. The artistic standard was high and the store was patronized by artists and fashionable people alike. It became internationally renowned for textiles. Liberty's flowing materials were ideally suited to the artistic style, and the name `Liberty silk' became synonymous with the material used by all the dressmakers for this new fashion, whether it came from Liberty or not. 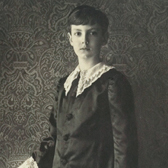 Liberty also produced artistic dresses in their Artistic and Historic Costume Studio. These clothes were described as never being out of fashion.